Szlachetka and his band perform at Hotel Cafe. Photo by Jessica Klausing. The minute Szlachetka crooned into the steel guitar opener “Algebra” the audience knew it was on a heartfelt journey. Bathed in blue stage lights and clad in a button up faded shirt and jeans, Szlachetka exemplified raw emotion and musical prowess. Delicate guitar strums coupled with rich, warm vocals. Electric guitars cranked up for the rock n’ roll road trip anthem, “Ready To Run Again,” forcing everyone up on their feet. Szlachetka photo by Jessica Klausing. Szlachetka closes with "Back Into Your Heart." Photo by Jessica Klausing. 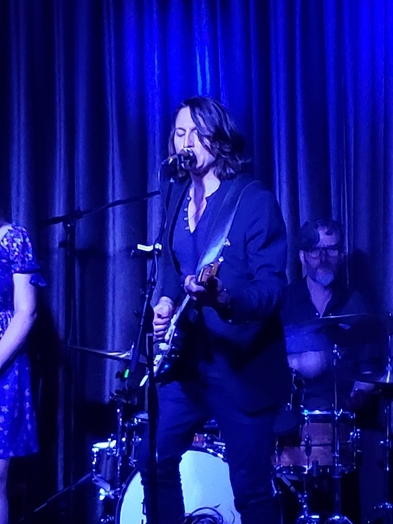 Closing with the upbeat “Back Into Your Heart” off the Waits For a Storm to Find album, Szlachetka was greeted with blazing smiles and hearty handclaps as the show came to an end. Szlachetka performs his eclectic twist on the Americana sub genres, bringing together singer-songwriter sentiments, country western, 1970’s California roots rock, and so much more. His songwriting captures plenty of emotional moments on par with legends like Jackson Browne and Jason Isbell. Szlachetka and his band deliver a top notch intimate performance worthy of a big stadium.